Set/3 Tiki Torches *GLOWS* for Gypsy Miniature Fairy Gardens. 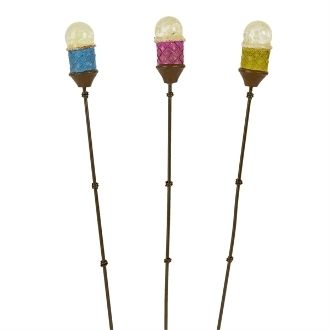 Full Description: This set of 3 mini tiki torches is the perfect addition to any mini patio or beach garden. Designed by Genevieve Gail, the tiki torches glows in the dark and feature all-weather paint!